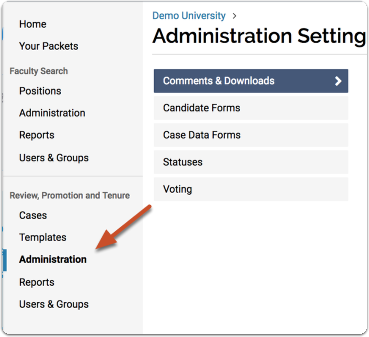 Administrators in Interfolio Review, Promotion, & Tenure can create two kinds of forms; candidate forms and case data forms. Where candidate forms are used to collect additional information from candidates, case data forms are used to include additional data about candidates in a case. 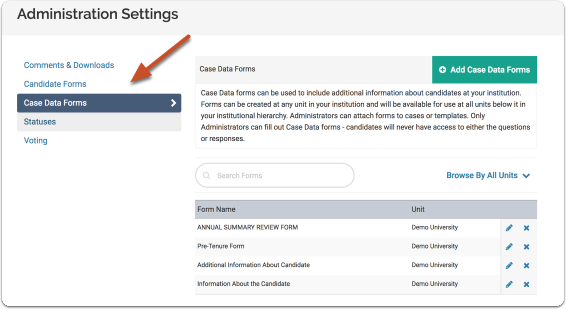 Where candidate forms are filled out by candidates, case data forms are filled out by Administrators in the program, and are designed to allow the Administrator to add data to the form over the course of the case. 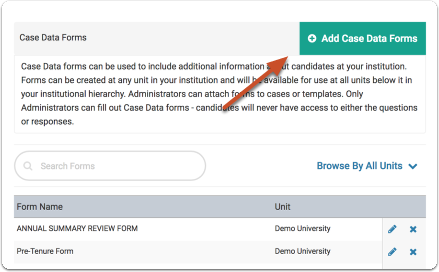 Case data forms can be created at any unit in your institution and will be available for use in templates or cases at all units below it in your institutional hierarchy. Only Administrators can fill out case data forms. 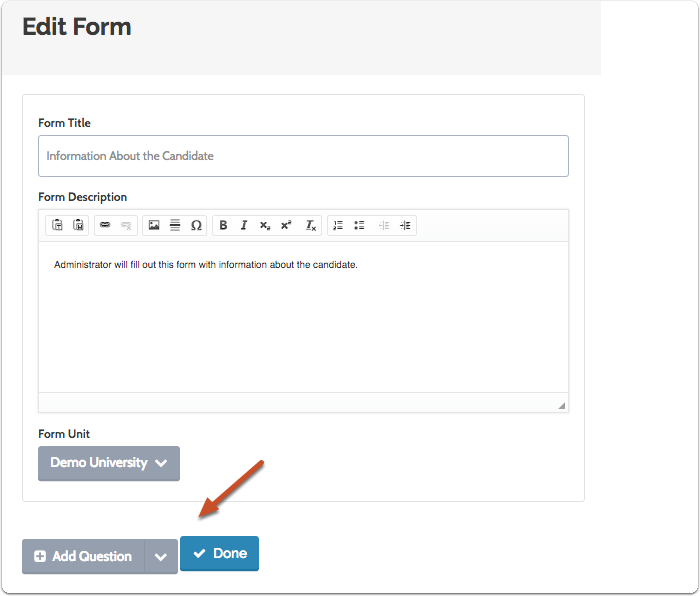 Candidates have no access to case data form questions or responses. This article explains how to create a new case data form in Interfolio RPT. Please note that creating and adding a form are not the same process. 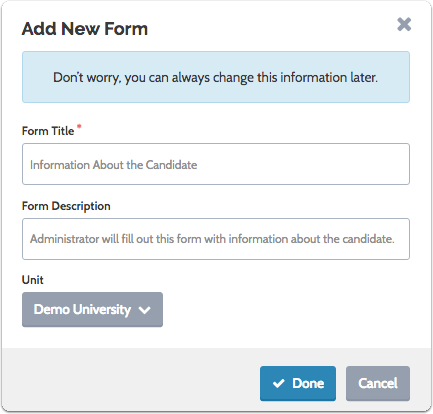 Forms are created from the Administration page, but are attached when creating or editing a template or case. Enter title and description of the form, select a parent unit, then click "Done"
The form will be available for cases created at or below the parent unit in the organizational hierarchy. 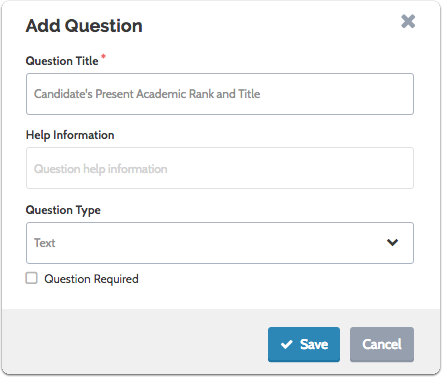 Enter a question title, select question type, and click "Done"
Note that you can select text, paragraph, multiple choice, checkboxes or grid questions. Prompt the person filling out the form to respond with one line of text. Best suited for short answer, free-form responses. Provides an entire text box for longer, paragraph-form responses. Presents the respondent with multiple answer choices, of which they can choose one. This type of question can also work for True/False, Yes/No, and other binary questions. You can also provide respondents with a box for "Other," where they enter their own answer. These provide respondents with multiple answer choices, of which they can choose one or more. You can provide respondents with a box for "Other," where they can enter their own answer. 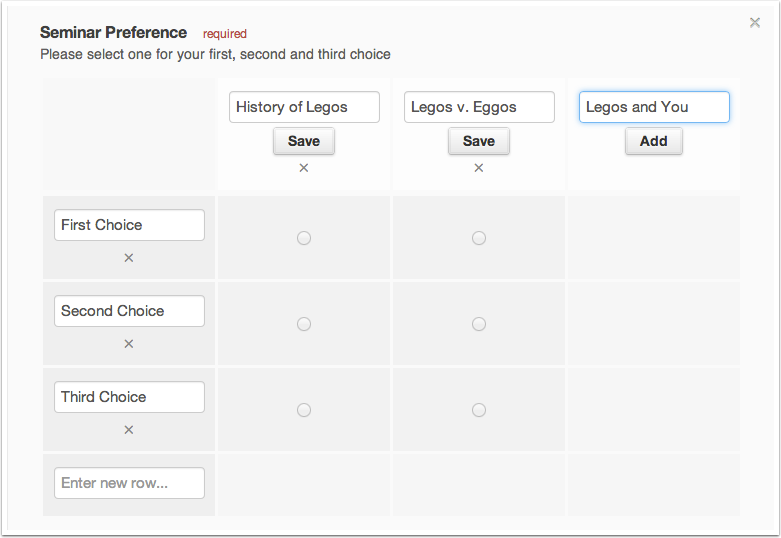 Presents respondents with columns and rows, of which they can select one option per row. This type of question can be used to express preferences, e.g., which courses the respondent would like to teach. Once your form is created, you can drag and drop questions to change the order in which they appear. 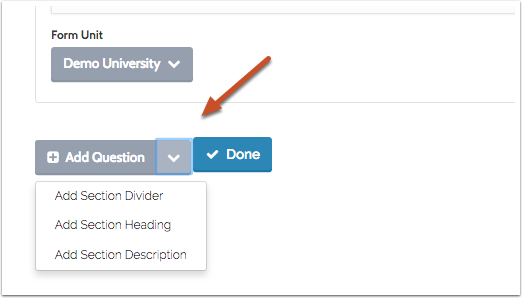 Click the down arrow to the right of "Add Question" (indicated below) to add organizational elements to the form.